Well, it's been almost a year, so I suppose I should get around posting this one. 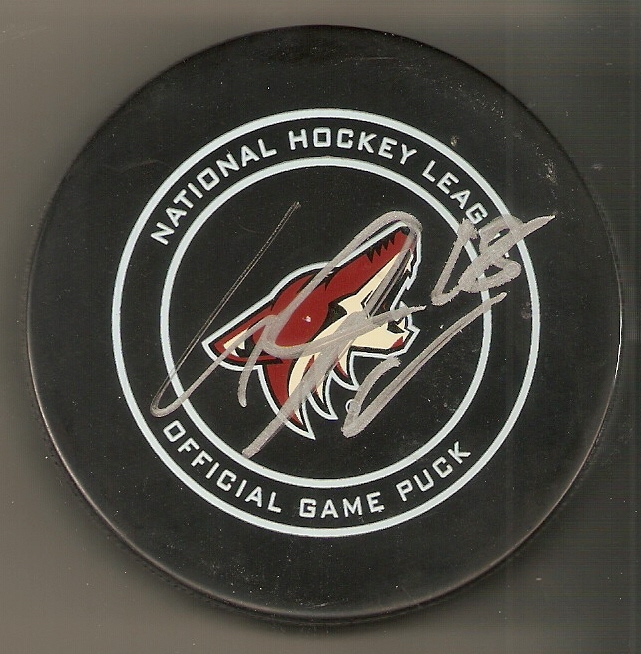 Anyway, my family and I made our annual trip to Arizona last Spring, and as luck would have it, there was time for one Arizona Coyotes game, when they hosted the St. Louis Blues. It ended up being quite the fun game as well, as the coyotes trounced the Blues 6-1. 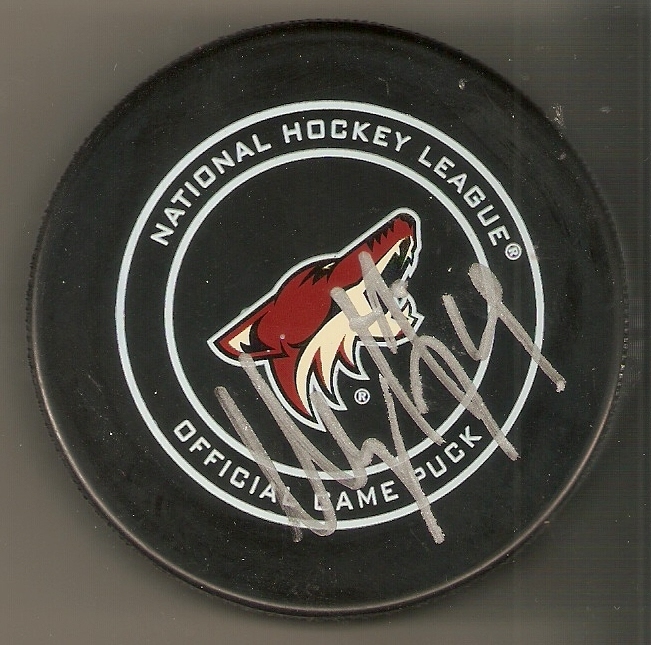 Six different Coyotes ended up each getting a goal that night, and afterward I hung around at the usual spot to get some autographs from the players as they left the arena. 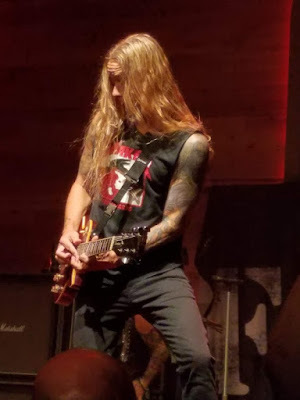 Well, it was a great weekend for live music a few months ago in North Dakota. 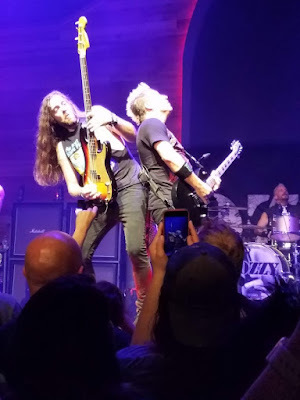 On a Saturday, I went to Grand Forks to see Metallica, and the very next day, I had the opportunity to see Fozzy right here in Fargo. Fozzy was formed in 1999 as a cover band, where guitarist Rich Ward of Stuck Mojo would get together with whichever musician friends of his were available to perform cover songs under the moniker "Fozzy Ozzbourne." 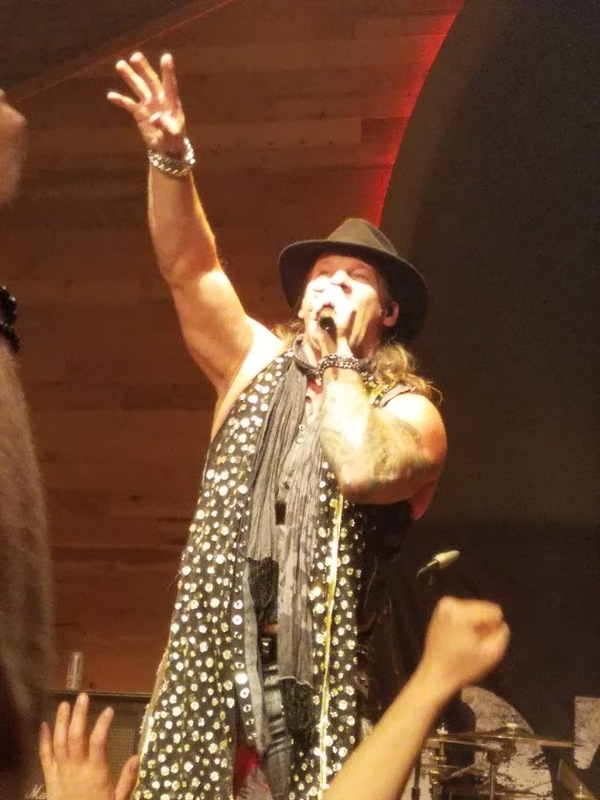 Eventually, WWE wrestler Chris Jericho would become a frequent guest as a vocalist, and a friendship, and permanent band, were formed soon after. They shortened the name to just Fozzy, and here we are, 19 years and 7 albums later. This was actually Fozzy's first visit to Fargo, and they packed the Sanctuary Events Center with a pretty good line up. The Stir kicked things off, who reminded me of a less thrashy, more bluesy version of Overkill. Stone Broken came on next, who are a hard rock band out of the U.K. who reminded me a lot of Sixx A.M. Adelita's Way came on next, and had a pretty good following here in Fargo. I thought there were some technical problems with the vocals, which were overpowered by the instruments, but they do have some good music. Fozzy was the headliner and kicked things off in a big way with the title track from their most recent album, "Judas." Each song was sure to a be a high energy track with the purpose of getting the crowd moving throughout the set. No dull moments, no ballads. Just heavy music from start to finish. 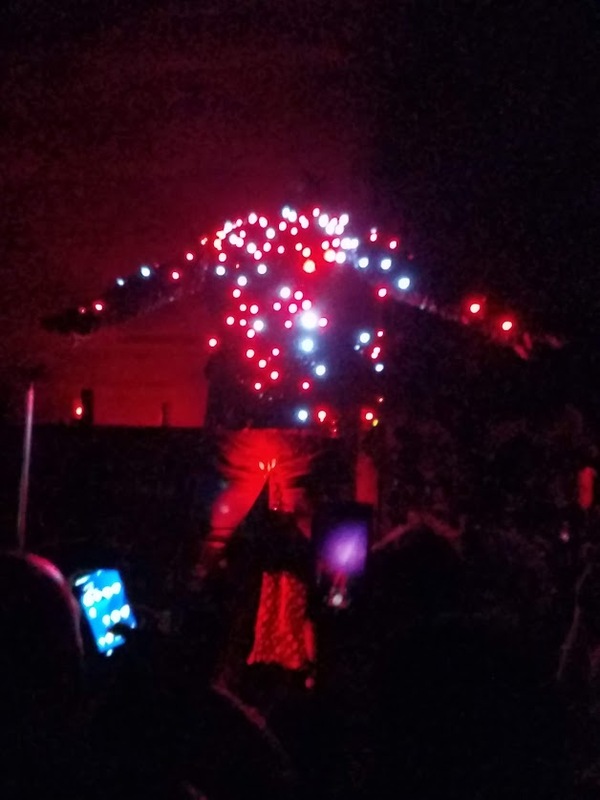 The interesting thing, for me, was seeing Jericho perform as a frontman. As a huge wrestling fan, I have been a fan of his since his early days in WCW in the late 90s, and was curious to see how his talents would transfer from that world into this one. The truth is, there are a lot of things that can transfer over, and you can see a lot of his in-ring character influence the way he leads the band. as a wrestler, the number one thing you need to do, is get the crowd involved. Whether they are cheering you or booing you, the most important thing is that they care about whatever it is you are placing in front of them. Most bands, go from song to song, play their music, and leave. Jericho never rushes anything. Before, during, and after, he always make sure that the crowd is involved with the show, whether by chants, hand motions, or a call and response. 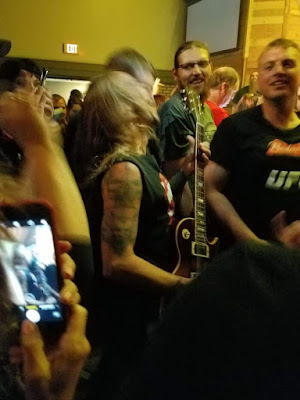 It looks like the band is having a great time on stage, and that helps the fans have a great time, as well. The band itself is also really good at keeping up with Jericho's enthusiasm. Ward was all over the place, even playing one of their songs in the crowd! Fozzy's music is really good on its own, but what the group really excels at is the live experience. 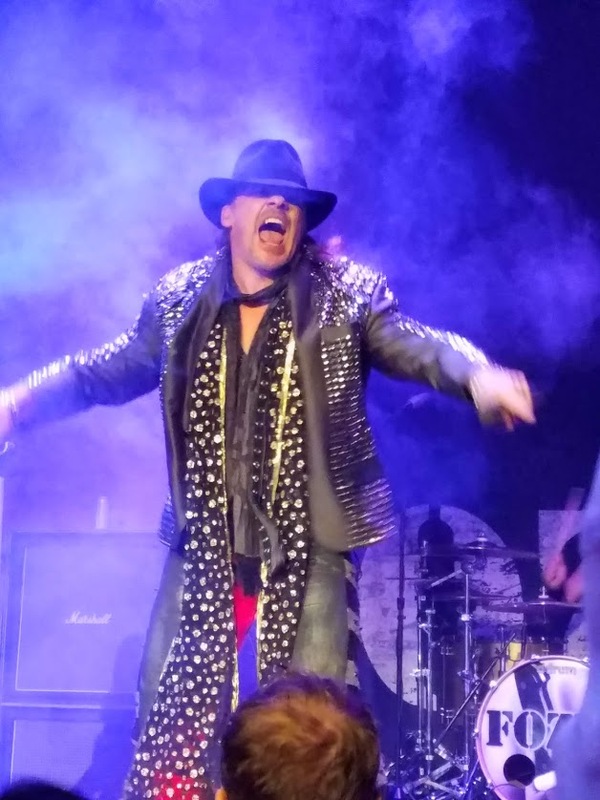 Jericho isn't shy about naming Kiss's Paul Stanley as his biggest influence as a frontman and even recalled travelling down from Winnipeg as a teenager to see Kiss at a race track in Fargo, specifically how Stanley would yodel the name of the city (FARGOWOWOWOHOOO!!!). 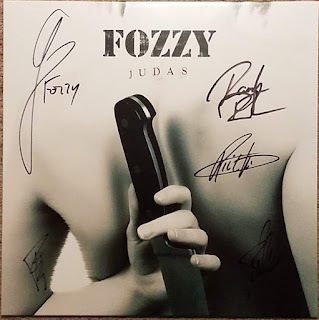 Of course, I had to make a stop at the merch table, and ended up getting a signed copy of Judas on vinyl. I had originally planned on getting one of their VIP meet-and-greet packages, but the funds weren't there at the time, so this was a pretty good compromise in still getting some ink. Fozzy was great that night. The music is good, of course, but when you see a band live, you want just that little bit extra, and Fozzy makes sure that not only is it a good show, but it is a great experience. My wife and I attended our first Fargo Force game of the season back in October, when they hosted the Sioux Falls Stampede. We actually won four tickets to the game from a local business, so the money we save on admission meant more beer money! The Force ended up losing 5-4 that game, but we had a great time. The game was close, and the Force ended up grabbing a 4-3 lead going into the third, but just couldn't hole on to it this time around. 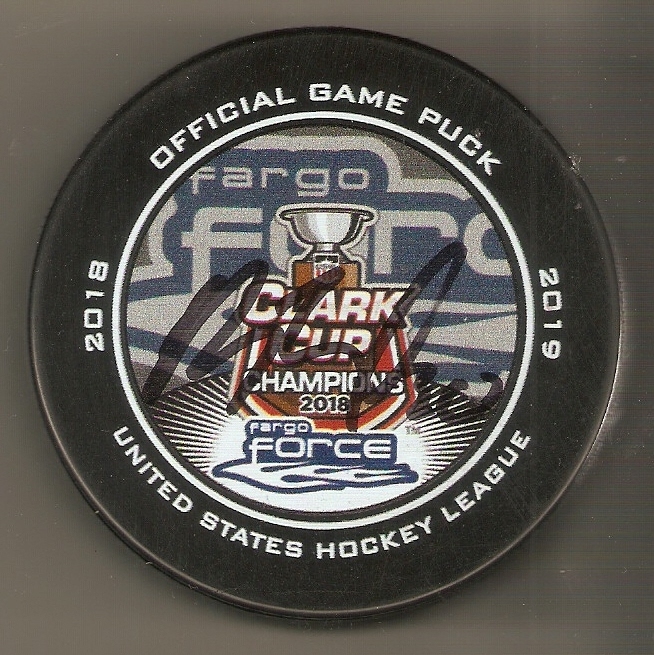 The Force are currently putting together a winning season at 16-10-1, but are sitting at sixth in a highly competitive Western Conference. 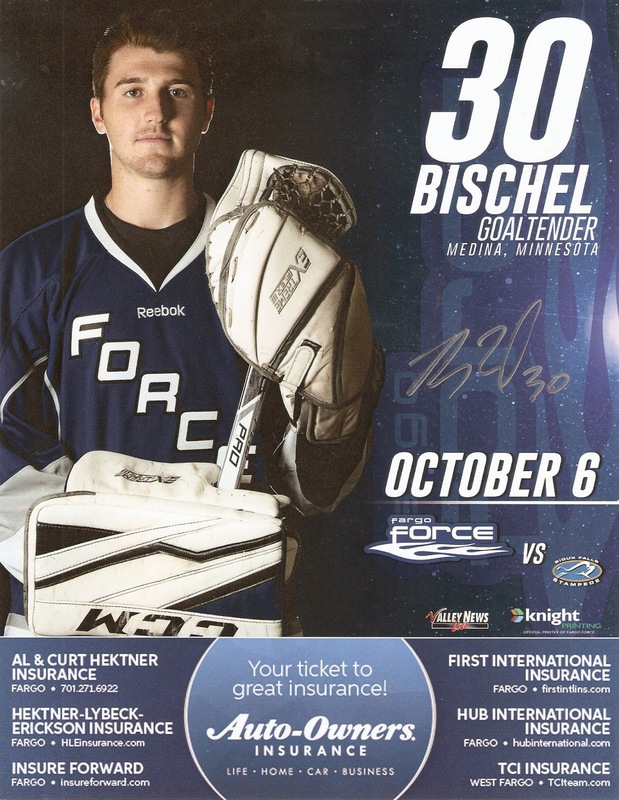 As always, the Force had one of their players signing autographs for fans after the game. This one, ended up being goaltender Ryan Bischel. 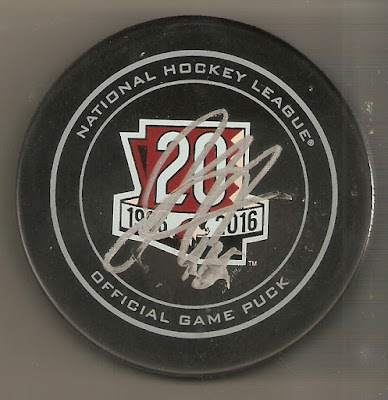 I had him sign a line-up cards and a 2018 Clark Cup Champions puck. The hockey season always makes the winters up here just a little more bearable. 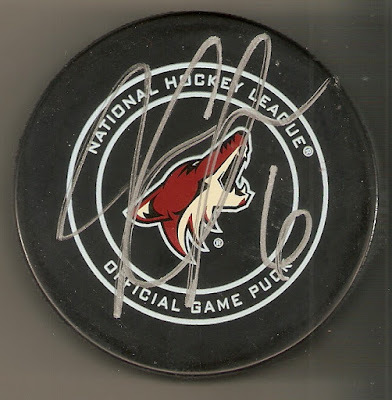 I'm looking forward to getting a few more in this season, and grab a few autographs while I'm at it. So, after years of being aware of the event, but unable to attend, I finally made if to FanHQ's annual Justin Morneau Winter Warm-Up Coat Drive! The two partner up every year, fro this event, which aims to collect winter coats for the Salvation Army, to benefit underprivileged citizens of the Minneapolis St. Paul are, and as brutal as Minnesota winters can be, there is definitely a need. 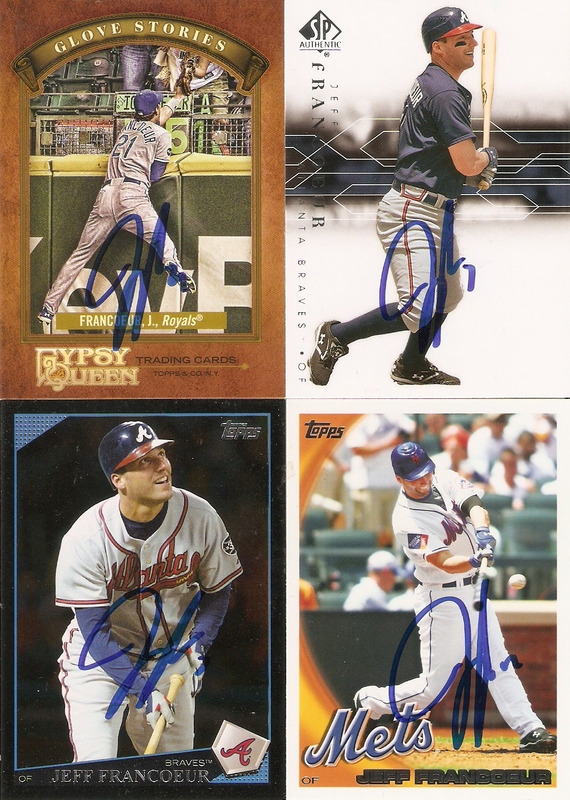 In year's past, all it took was three winter coats for the chance to meet the 2006 AL MVP and get anything signed. A bargain for sure. This year, the staked were raised. The required number of coats went up to five, but those two extra would also get you a signature from two other guests: former Twins Joe Mauer and Corey Koskie! 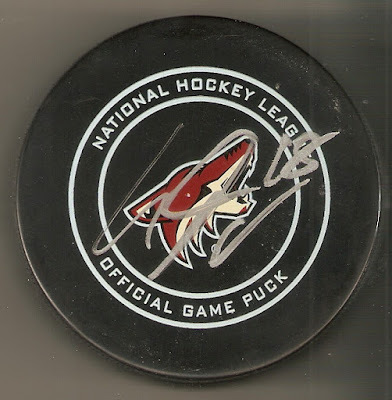 With all three autographs on any item for just five coats, I knew that this was an event that couldn't be missed. So, my wife and I dropped the kids off at my parents' house and we made the drive to the Minneapolis area's Ridgedale Mall, where she would do some Christmas shopping, and I would meet some baseball players! We got there on time, but not too early, so I ended up at the back of a very long line. The way FanHQ does their signings, they do all of the posed photos first, and then move on to the autographs. Posed photos required a 33-coat donation, which was a little more then I was able to get my hands on. Still, an autograph from each is a great deal for five jackets. 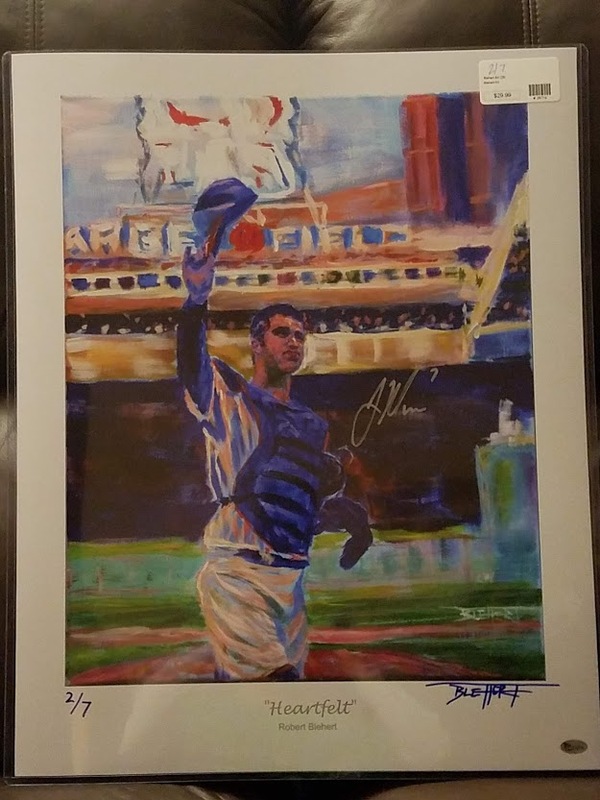 I knew that if I were to attend a paid signing with Joe Mauer, the price would be pretty steep, so for this "free" signing, I wanted to be sure to make it a good one. My initial idea was to get a jersey signed, but most of what I was able to find on Ebay was either well-worn, or a knock-off. I ended up getting a fantastic-looking 16x20 print of a painting by local artist Robert Blehert. It depicts Mauer saluting the fans as his final game came to a close. The print was signed by the artist in blue ink, and numbered to just seven copies! I had Mauer sign it in silver, which really stands out on the blue background of that section. It really turned out well, and I now have it proudly displayed on the main wall of my man cave. Now, it has been a few months since I attended a FanHQ signing, but I think this was the first one where they added another special feature. I didn't realize it until a few days later when they posted on their Facebook page, but they hire a couple photographers to take pictures of Mauer and Morneau signing each item for everyone who came. This way, even though you might not of been able to get a posed photo, you could still get a picture of you interacting with them, and them signing the item you brought. Pictures could be purchased on-line from the photographer for $10 a piece, and was an amazing addition to the whole experience. Mauer may have been the big draw for this event, but Morneau is responsible for the event itself. This is the ninth year of the coat drive, and as a former AL MVP and NL Batting Champ, is a pretty good signature to be able to get. Like with Mauer, I didn't come with an item in-hand, but quickly decided that I wanted to get him to sign a bat. 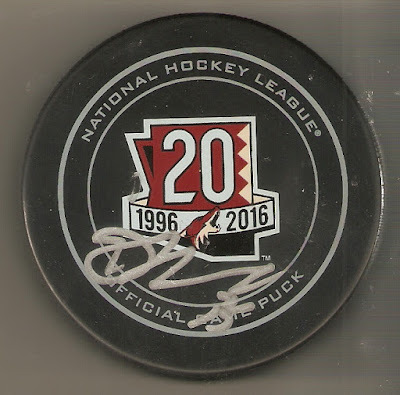 After all, if I was going to get a "free" signature, it might as well be on an item that would otherwise carry a premium price tag. 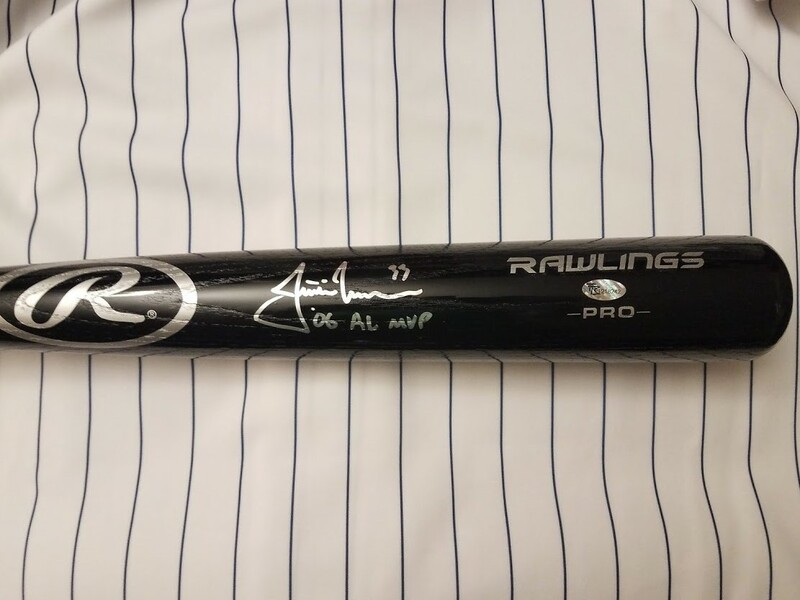 They had a few game model bats with Morneau's name engraves on it, but when I saw the color (and price) of the generic Rawlings silver and black bat, I went with that. 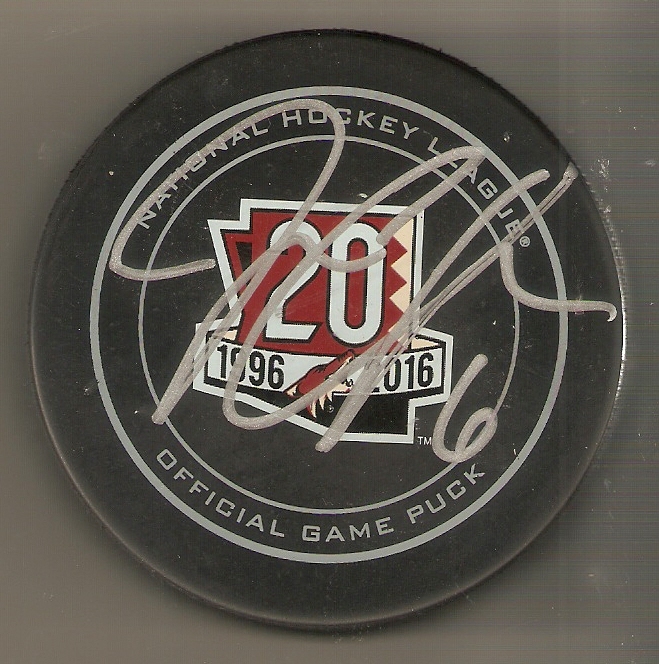 Morneau has a great signature as it is, but I decided to pay an additional donation to the Salvation Army for an inscription ticket. 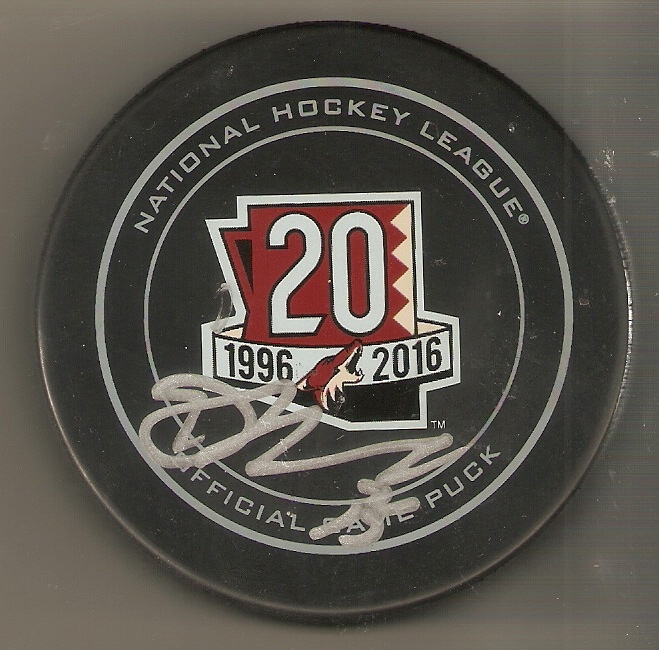 Of course, I had him sign in silver, with his "06 AL MVP" inscription, and really, it turned out better than I could have imagined. 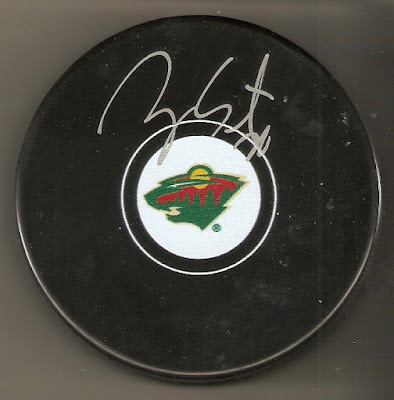 Of course, I also purchased a photo with him, and this on turned out even better than the one with Mauer. 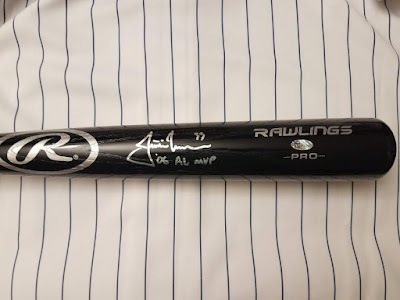 While the picture with Mauer is of him signing my item, the one with Morneau is of him handing off the freshly-signed bat. 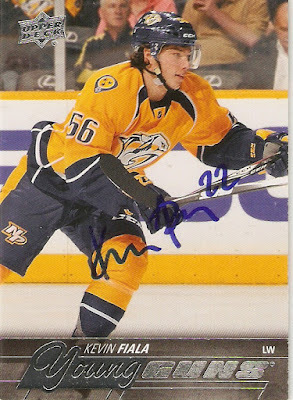 Lastly, was Carey Koskie. Like Morneau, Koskie is a Canadian former Twin. He played third base for the Minnesota Twins, Toronto Blue Jays, and Milwaukee Brewers. I brought along a baseball for him to sign. I also had to pick up one more Mystery Ball. 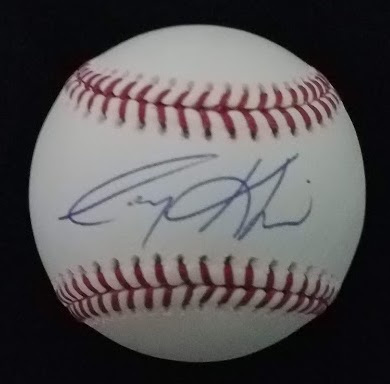 Eventually, I will buy enough that I will run the risk of pulling something I already have, but for now, I got a new one, of Twins pitcher Kyle Gibson. Lastly, I was able to pick up the Gary Gaetti jersey that I selected in their multi-sport jersey auction a few weeks earlier. The jersey was a home jersey in the design of the 1987 World Series winning team, and is signed in silver, right on the center bar of the 8, which is where I'd prefer a signature to be. It looks good on a photo, but it looks even better in person. The event turned out great. I had a good time there, got to meet some baseball players, and help out a good cause. As good as this year was, next year will be the tenth anniversary of the event, and I can't wait to see what they have in store! Every year, FanHQ, a memorabilia store in the Minneapolis area, hosts a coat drive, featuring 2006 AL MVP and former Minnesota Twin, Justin Morneau. Shawn, the owner of FanHQ and Morneau have become good friends over the years, and the two get together for a coat drive to benefit the Salvation Army every fall. 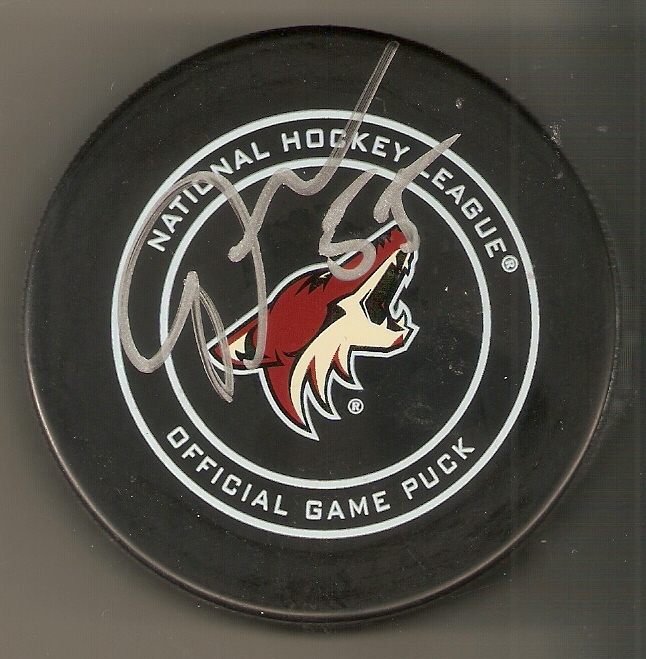 In past years, you were able to donate three winter jackets, and in return, get an in-person autograph on the item of your choosing. Those who couldn't get three together, or couldn't attend the event, could donate one coat in exchange for an 8x10 of Morneau that he signed ahead of time. This would be the ninth year of the annual coat drive, and this year, they really stepped things up. The number was moved up to five, but in return, you would not only get an autograph from Morneau, but also fellow retired Twins, Joe Mauer and Corey Koskie! I was getting super excited for the event, and began to get my coats together, ready to bring them up for the Dec. 1 event, but three weeks ahead of time, FanHQ posted on their Facebook page, that all 200 of their autograph tickets had been claimed. I was a little down, as I was really looking forward to such a great opportunity. My luck would change, though, as the very next day, they announced, that all three parties had agreed to do 22 more, and that they would be made available the next day when the store opened. I knew what I had to do. I told my wife that I would be driving to Minneapolis and back the next morning (7 hours round trip), and surprisingly, she didn't give me any pushback on it. 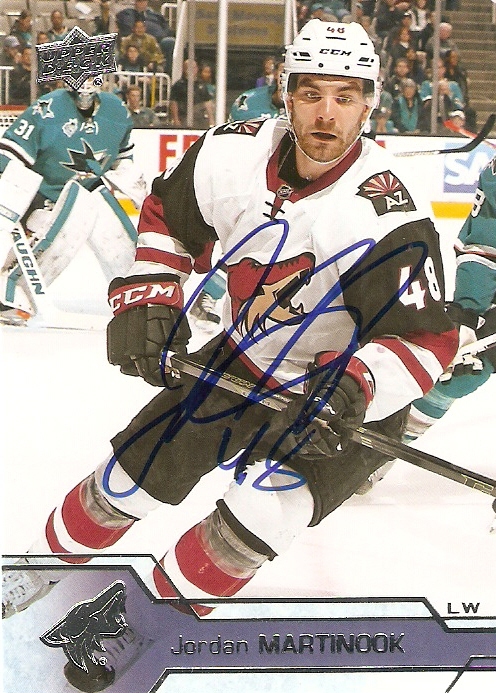 It would be a big trip to have to essentially make twice, but getting those players on some premium items at a great price was too good an opportunity to pass up. I left my house at 6 a.m. and got there at 9:30. I was the sixth person in-line, so I was definitely getting a ticket. 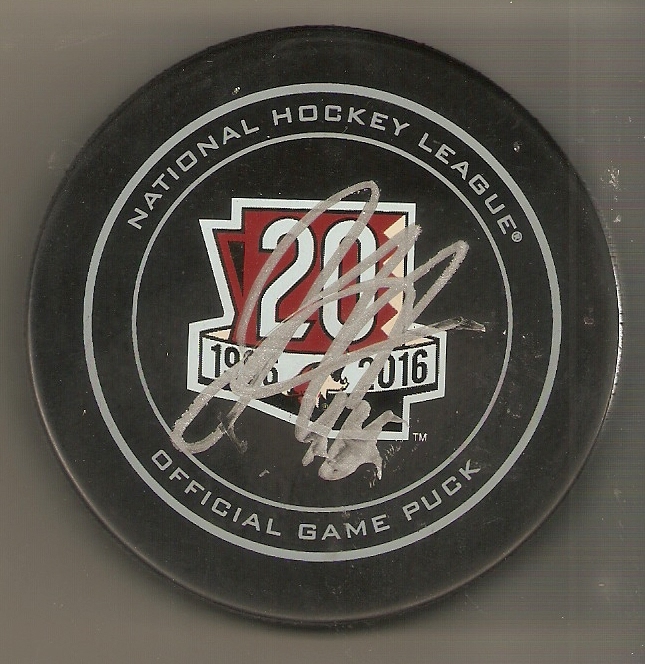 I had six coats in total, which gave me the autograph ticket for the event, as well as a signed Morneau 8x10. Now, I never like to leave without spending a little money, so I picked up two of their mystery packages. I got one baseball and one hockey puck. Basically, each sealed box comes with one signed item, which is a mystery until it is opened. 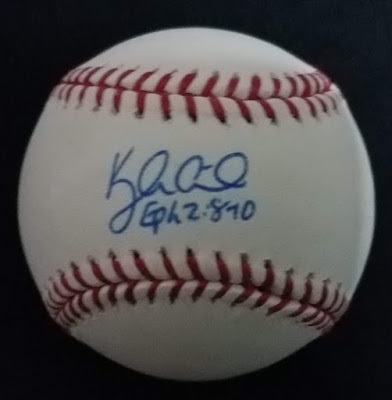 My baseball was of former Twins pitcher Brandon Kintzler, who is now playing for my Chicago Cubs! 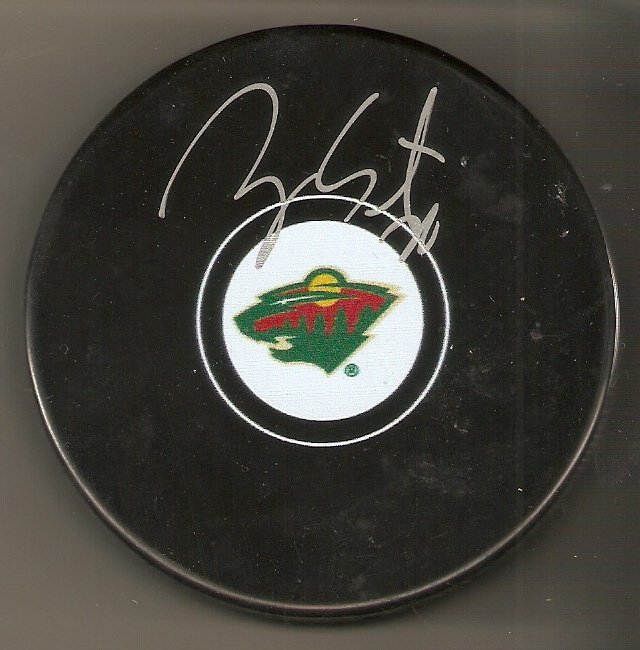 The puck was of Minnesota Wild defenseman Ryan Suter. 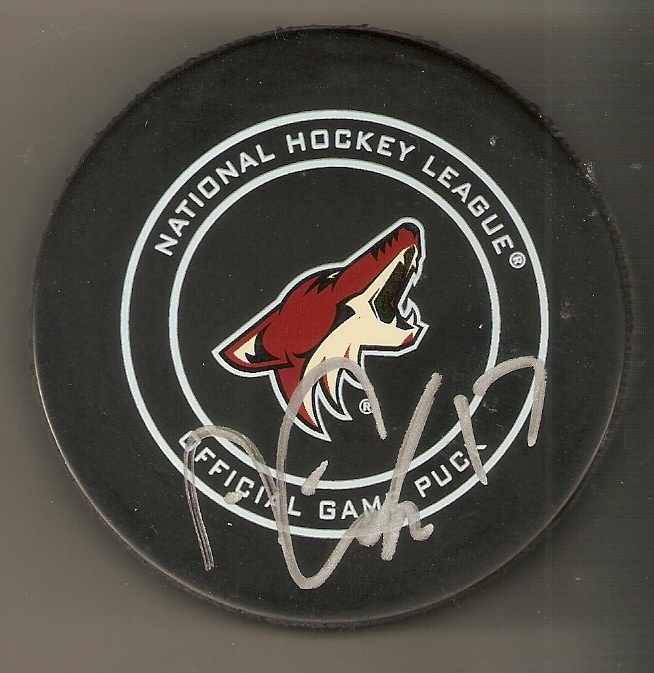 I already have a Suter puck, but it's on an official game puck, so even though I already have this player, at least it's on a different design. Lastly, I also put in for a new concept they are doing with some of their surplus items: a multi-sport jersey draft. Essentially, 15 spots are open for a set price. When all of those spots are filled, names are drawn for the order, and then each person picks which one they want. There were four that I really wanted, and as luck would have it, I was selected to pick fourth. 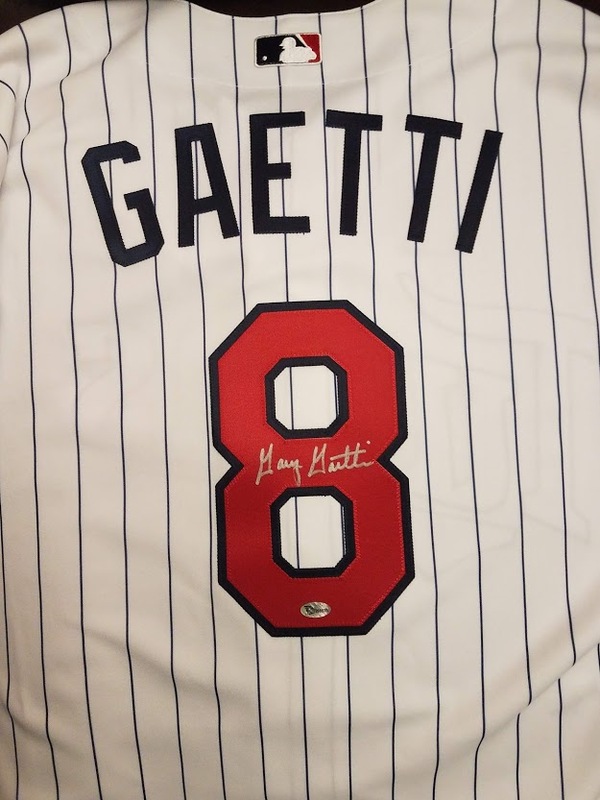 I ended up with an authentic model Twins jersey signed my 1987 World Series Champ Gary Gaetti. 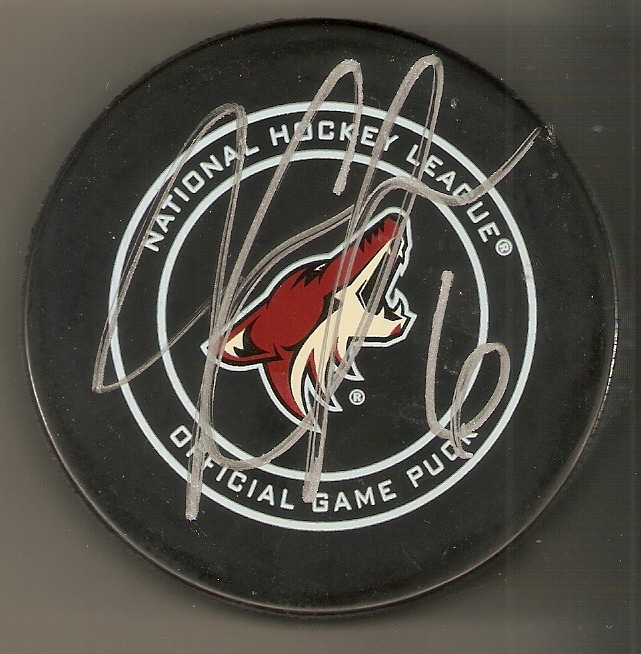 I was already home when the draft took place, so I would have to pick it up on the day of the coat drive signing. I'll share pictures of it when I post on that, but it looks amazing! Well, my next post will be on the event itself. It ended up being a lot of fun, and I really came back with some spectacular additions to my collection.